During the National Pavement Expo, and at every Sweeper Summit, the #1 topic of discussion is HIRING. How do we hire enough people? How do we get good people and how do we keep them? These are constant issues discussed at any gathering of power sweeping companies. Less headaches for your whole team! Through ApplicantPro, 1-800-SWEEPER partners receive access to custom assessments designed specifically for nighttime and daytime sweeper operators. 1-800-SWEEPER partners don’t have to pay added fees which can reach several thousands of dollars, as we pay them for you. Ads are only $99 for 30 days. Your first ad is FREE for first times users. The ApplicantPro system makes it easy for job applicants to apply for a job with us, allowing for a larger volume of applications resulting in a bigger pool from which to choose. Using ApplicantPro is simple and intuitive. Once you have written your job posting (or selected from several existing template jobs) ApplicantPRO makes it simple to publish your open position to free and paid job boards. Once applicants apply, you can filter out specific applicants based on their abilities, experience, and the way they answered certain questions. Right from the start, the quality of your hires will be greatly improved. 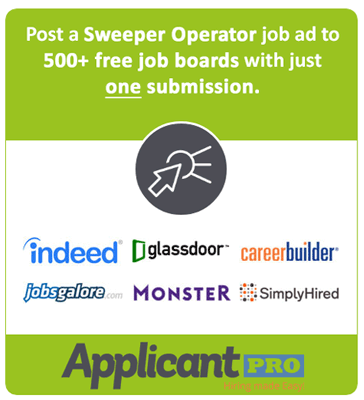 ApplicantPRO can automate the job postings process for you, or you can select which jobs are posted to which career/job boards. LinkedIn, Twitter and Facebook postings can also be automated with ApplicantPRO as well. Applicant pro has a professional, dedicated system to help you candidate search, hire and retain employees – helping to solve every sweeping company’s #1 issue. You’ll get more responses from higher quality candidates. Contact Andy Williams to help you access already-prepared 1-800-SWEEPER screening questions, get training on ApplicantPro and set up a free trial today!